"The traditional Spanish recipe for Patatas Bravas is really simple with golden potatoes and aioli, but our Patatas Bravas are unique. You have delicious Peruvian potatoes with a black garlic that is unbelievable. There is also a sweetness to it with the jam on the top." "I love lamb a lot, so when people ask me what hot tapas to order I always recommend the Merguez Croquettes. They are stuffed with a goat cheese and lamb mixture and the seasoning is perfect with cumin, salt, pepper, etc. Not everybody loves lamb, but when it's well-prepared and seasoned right it's amazing." "The Jamón Coca is the perfect dish if you want a little taste of everything with Serrano ham, peppers, onions, and dates. It's also a great dish to share." "You will not find the the Caliente Rock anywhere else. I've been traveling for 10-11 years now and I haven't seen it. The presentation is unique with tender strips of Wagyu beef and roasted vegetables on the side. It's really a show!" "The Shrimp Gambas is one of my personal favorites. I love the heat that this dish brings with the chili oil and chorizo. Not to mention I love shrimp." "The Whipped Salt Cod is a great starter. It's almost like a mini charcuterie board, but with fish instead of meat. It's very savory and a good palate cleanser. The cod is whipped and fluffy and goes great with the olive bread." "I always recommend the Scallops since they have both savory and sweet components with the scallops themselves and the blackberry gastrique." "My favorite thing on the menu is the pulpo. Personally, I think it's one of the more complex dishes on the menu. It's marinated and braised and the texture ends up being something that no one expects. It's tender, almost like a chicken breast with salsa verde, thyme, and pickled apples. Once guests get past the idea that they're eating octopus it quickly becomes one of their favorite items." "I really love the Tuna Plancha, especially the presentation of it. 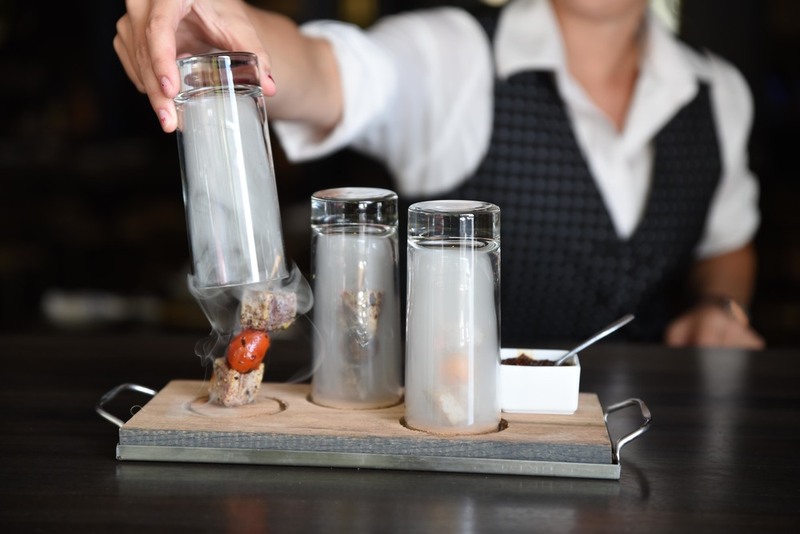 It's something that no one really expects when they lift the glass and smokes comes out reveling the skewers. And just for personal benefit, I work really close to the kitchen so when ever someone uses the smoking gun it smells amazing." "If I'm not pouring straight sherry, I'm going to be making a Cobbler's Daughter. It's a classic cocktail, and I love the fact that sherry is the star in it."